This entry was posted on November 18, 2018 at 5:02 AM and is filed under the bad. You can follow any responses to this entry through the RSS 2.0 feed. You can leave a response, or trackback from your own site. Considering that RAJNIKANTH’s films tend to be ALL/ONLY about him, it is surprising that Akshay’s name is also mentioned in the 1st poster!! I am of course happy for Akshay. I just hope he doesn’t get a raw deal here because he will be buried deep in the Rajnikanth universe. He is doing quite well in Bombay and doesn’t really need to be second fiddle to anyone..
It’s not just name but Akshay is present in this first look poster too. This movie is aiming to be truly ‘out of the box’ and in some ways trying to keep global audience in mind…..If true numbers are humongous and budget rumors of 360 crs and India’s most expensive movie. Some are saying combined budget of both bahubali is 110 crs less than Robot2 . The entire cast and crew of the film including Amy Jackson, music director AR Rahman will be present on the occasion. The London based producer Subaskaran of Lyca Productions has roped in Karan Johar to host the show, which will be broadcast live on Lyca Productions You Tube channel. The production house has roped in Wizcraft the entertainment company, to put together the first look event, which is touted to cost around Rs 5 Crore. The idea is to give 2.0 a big launch as the film is being made in Tamil, Hindi and Telugu and will have a simultaneous release. The first look of Rajinikanth and Akshay will be revealed in 3D. The function is being held in Mumbai to attract the attention of the national media. The marketing of the big -budget extravaganza is pegged around Rs 40 Crore. Is this a part of Rajnikant’s contract that the word ‘super star’ has to appear before his name on the poster or trailer? This seems so corny. It is for his fans in Tamil Nadu – else they will burn the theater down..
Superstar is the nickname of sorts attached to every star down south. If Rajni is a superstar, no other will use it infront of his name. Similarly we have other names like Megastar, Ultimate star, Powerstar, Lovely star, Rising star etc for each individual stars. They also have characters which brought them recognition attached to their names. Some actors also use their popular character names instead of these titles. Like Vikram is always referred as ‘Chiyaan’ Vikram as he got famous with the movie ‘Sethu’ and Chiyaan was his screen name in that movie. Sethu is Salman’s Tere Naam original and won Vikram all the awards that year. Very excited to see the trailer. Looks like Hindi version will be pushed more as the first look is happening in Mumbai. The budget of the movie is huge 350 crores (compared to Bahubali’s 2 parts are 250 crores). It has to do business like Bahubali part 1 to make everyone happy. I think the stage is set and Shankar has no reason to mess this one up. Looking forward to it. This is entire Aamir khan’s makeover done in his career in one look!!! Fantastic posters. I think this will be full on comparable to Hollywood super hero movies. What they make in over 1000 crores, Shankar will pull to an extent in his 350 crores. Huge benefit for Akshay kumar as this might be blockbuster over 250 crores easily. All posters seem overdone. Hope the actual movie is not so garish and is watchable. Really loved Robot except towards the end which kind of dragged on and on and seemed misuse of vfx. But Shankar, the director is wacky in imagination so worth the ticket there itself ! Movie is clashing with Golmal 4, but this will be one of the few times where both movies will work and will have an audience. Diwali always has scope for two movies and 2017 will fulfill that demand. Brainless comedies will always have a way with Indian audience as we live in tense times and don’t wish to tax our brains more. Personally I am a huge fan of Golmaal 3 and Rohit Shetty kind of laughter track. Looking forward to 2017 Diwali ! I will be surprised if any movie will now release across India during Diwali – North South East West. So Golmaal 4 will get shifted. In South 2.0 will be a mayhem. In rest of India, Akshay + Rajni will be a major crowd puller. I just feel Akshay should be made less evil from now on else children may get frightened. Rajnikanth is in triple role – Dr Vaseegaran, Chitti and a new character. Here is why we think 2.0, and not Baahubali, may win the tag finally. Mumbai: Superstar Rajinikanth on Sunday said he was quite tempted to play Akshay Kumar’s role in his upcoming Tamil science-fiction actioner “2.0”. He said Akshay is the real hero of the film. “If given a chance, I would have played Akshay’s character. He is the real hero of the film,” Rajinikanth said. Rajinikanth believes his upcoming Tamil science-fiction actioner 2.0 is not a prestigious film just for its makers but for the entire Indian cinema. “I enjoyed working on this film. This subject is very unique. This is not just a prestigious picture for the producers, director Shankar or the unit but it’s one for the whole Indian cinema,” Rajinikanth said here at the first look launch event. He’s confident the Rs.350 crore mega budget film will match Hollywood standards. “Despite our (Indian cinema’s) technical excellence and the financial strength, we could not reach Hollywood standard yet. But I’m confident this film will reach Hollywood level. It’ll be a film our entire Indian film fraternity will be proud of,” he said. Rajinikanth plays doctor-scientist Vaseegaran in the film, which is a sequel to his own 2010 blockbuster, Enthiran. Akshay Kumar plays a scientist called Richard, who turns into a Crow Man after an experiment goes wrong. Also starring Amy Jackson, Sudhanshu Pandey and Adil Hussain, the film is being completely shot in 3D, and is slated for Diwali 2017 release. “Its a brilliant role, character (of Akshay). The whole country will be proud of Akshay,” Rajnikanth said. Akshay Kumar’s villainous turn in Rajinikanth-starrer 2.0 will do wonders for his career. But how did Khiladi Kumar, the star of action films with patriotic ideals, come to this point? Akshay Kumar’s first look as the villainous ornithologist Dr Richard from Rajinikanth-starrer 2.0 has, for sure, earned the Khiladi thousands of new fans. Not just from down south, but fans of science fiction and quality character acting in cinema can also now look up to Akshay Kumar as someone who is more than the guy who plays goofy man-children or one-dimensional action heroes. On the one hand, Akshay’s upcoming films are with directors like Reema Kagti (Talaash) and Subhash Kapoor (Jolly LLB). On the other hand, Akshay has opened up a new market for himself in South India thanks to his villainous turn in Enthiran’s sequel 2.0. Little did anyone expect in the ’90s, that in the day and age of Khans, Akshay Kumar would go on to become as big a star as he is today. Akshay Kumar, Ajay Devgn and Suniel Shetty were the biggest action hero products of ’90s Hindi cinema. But today, Akshay commands a kind of stardom that Ajay and Suniel does not have. Meanwhile, with each film, Akshay is rising in calibre and charisma that can rival that of the Khans. How? For one, unlike Ajay and Suniel, Akshay showed his versatility in diverse genres, moving away from masala action films, whenever required. Teaming up with Priyadarshan, Akshay delivered one hit comedy after another (Hera Pheri, Garam Masala, etc). Similarly, he also proved his mettle as a commendable romantic hero with films like Namastey London and Dhadkan. In this regard, Akshay proved himself to be different from Aamir, Shah Rukh and Salman as well. While Aamir stuck to big-ticket character roles, SRK limited himself to romance and Salman remained stuck in his brawny, brat image. However, Akshay diversified. Akshay Kumar’s career has seen many highs and lows. While he has been mostly a consistent hit-giver throughout his career with the odd flops every now and then, Akshay saw one of his biggest career high points in 2007 with four back-to-back hits; Namastey London, Heyy Babyy, Bhool Bhulaiyaa and Welcome. Right after that, Akshay did some big-budget films, including a few with major studios working with him for the first time – Yash Raj Films’ Tashan and Warner Bros’ Chandni Chowk to China. Akshay’s 2009 films Kambakkht Ishq and Blue had humongous budgets. But all these films did not work. Akki soon went back to the drawing board with directors he had been loyal to – regular collaborators like Priyadarshan and Sajid Khan. Soon came Housefull and Khatta Meetha and all was well again. But perhaps, Akshay Kumar found his true admirer in A Wednesday! director Neeraj Pandey. Pandey saw untapped talent in him and positioned his action hero image and aura in the midst of taut, smart action-oriented dramas with themes that resonated with every Indian. As such, Special 26 and Baby elevated Akshay’s status to someone who is more than a mere entertainer. Soon, AR Murugadoss’s Holiday, Raja Krishna Menon’s Airlift and Tinu Desai’s Rustom, films made in the Neeraj Pandey mold, sustained Akshay’s new found stardom and critical appreciation. 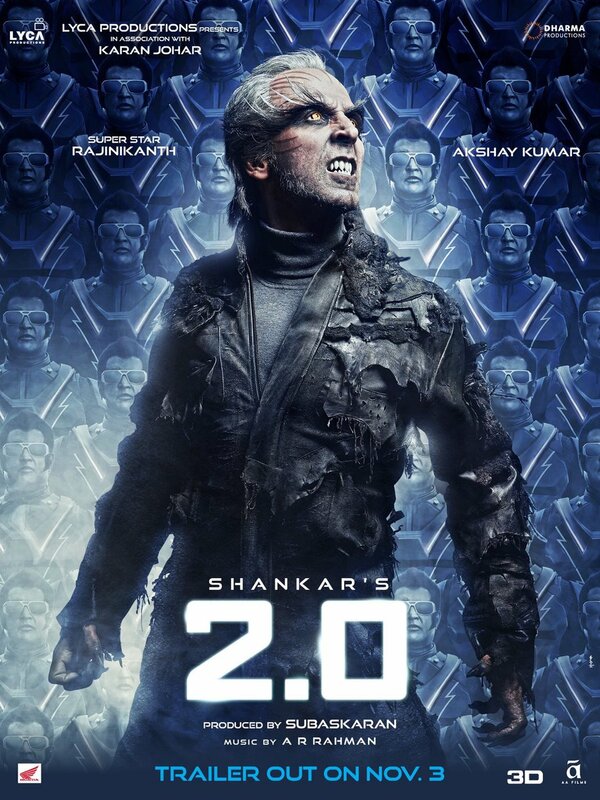 At this point, a big-budget science fiction extravaganza like 2.0 starring none other than Thalaivar Rajinikanth is a masterstroke for Akshay’s career. For one, 2.0 will give Akshay a pan-Indian following unlike any other Bollywood star at this point. Secondly, Akshay will be seen in an interesting character actor avatar which is different from the usual sincere, straight arrow roles he plays. From Khiladi to 2.0’s Dr Richard, Akshay has come a long way. Here’s hoping Rajinikanth-starrer 2.0 opens new doors for Akshay Kumar’s film career. 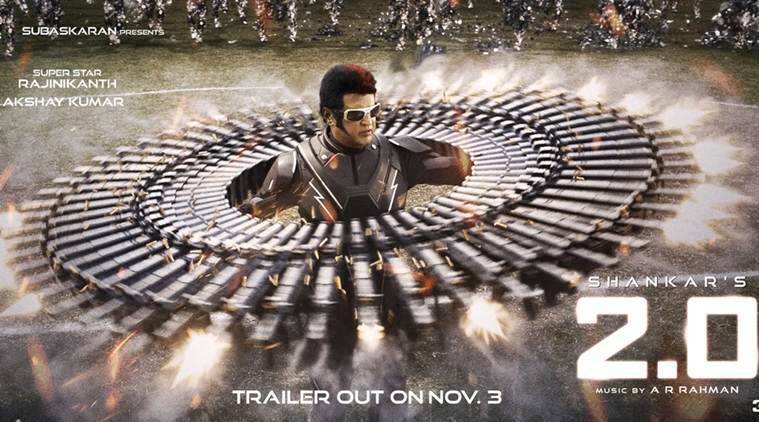 I’m a very great fan of Enthiran but these posters just aren’t promising. This looks like very lowbrow Marvel. Hope I’m wrong but these posters are ‘crazy’ and not in a good way. Hope you are wrong. If i look at these posters as one made in bollywood, i will also agree. Thankfully its by Shankar. However having seen Enthiran and liked it, I have trust on the technical crew which is India’s best. The budget of Rs 350Cr also seems just about right for this scale. 2nd poster (Rajni in 6 pack) is not official one. Its a fake, fan made poster and looks horrible. I think you commented based on it. thanks, Ill remove it. but I was referring to the Akshay poster as well. I’ve commented on his look before too. It’s utterly ridiculous. the new Rajni one is much better.. I don’t see much issue with the 1st look posters though it seems garish but that has been the case with Shankar in majority. Actually Robot 1 was the only ‘class’ Hit from him in ages. All the other movies and including 2 with Vikram were bad/average and even including Shivaji with Rajnikanth. All his movies he tries to balance between mass and class and only in Robot he achieved the class factor over mass factor. Rest movies mass factor > class factor. But if you go back to 90’s it was equal balance. Well I’ve loved his Vikram films. On the Shankar aesthetic I’ve not been a huge fan except when he’s worked with Vikram or when he’s done Enthiran. But he did have some good stuff earlier too that was a bit more toned down by his standards. It’s true that Shankar has never made a fantastic film (perhaps Enthiran is the closest to such a deal). Or I’d put it this way.. he’s a more interesting director than he allows himself to be in most of his films. Put different his formulations are often suggestive but he buries these within extremely (and often lowbrow) commercial elements. that however is not my problem with my posters. Given Akshay’s look her for example this seems too outlandish even by Shankar’s standards. And precisely because Enthiran was a very strong film I hope the followup is worthy in some sense. Anniyan was mess as a movie. ‘I’ had a very tame 2nd half and not pleasing to see on screen. But Vikram was great in both movies which did help overcome its short comings but the screenplay was nothing great in these both movies and rehash of previous movies. The first look of director Shankar’s multilingual science fiction film 2.0 has created massive anticipation and interest among fans. On one side, there is India’s biggest star at the moment, Rajinikanth, reprising his 2011 Enthiran roles Chitti and Dr Vaseegaran. On the other side, is the evil ornithologist Dr Richard played by Bollywood superstar Akshay Kumar who has an exceptionally interesting slate of films lined up in 2017. Starting from Jolly LLB 2 to Toilet: Ek Prem Katha to Crack to Baby’s prequel Naam Shabana, Kumar is starring in a variety of films. The major negative role in 2.0 will only add an unique edge to his film career so far. Well now, according to sources, for the first time ever in a Rajinikanth film, another star i.e Akshay Kumar in this case will get top billing alongside Thalaivar. Kumar’s name will feature alongside Rajini’s name all over India in the film’s teasers, posters, trailers and other promotional material. Now, this is unusual for a Rajinikanth film where only Rajini gets top billing. No longer Golmaal4 vs 2.0 clash!! Rohit Shetty averts clash with 2.0 during Diwali 2017 and moved away from the date giving it solo release. Director Shankar is fond of picturesque and rich locales across the world and is known to shoot at 7 different countries for just a single song. Irrespective of his taste for luxe, he chose to shoot for Robo completely in India as part of Prime Minister Narendra Modi’s ‘Make in India’ campaign. 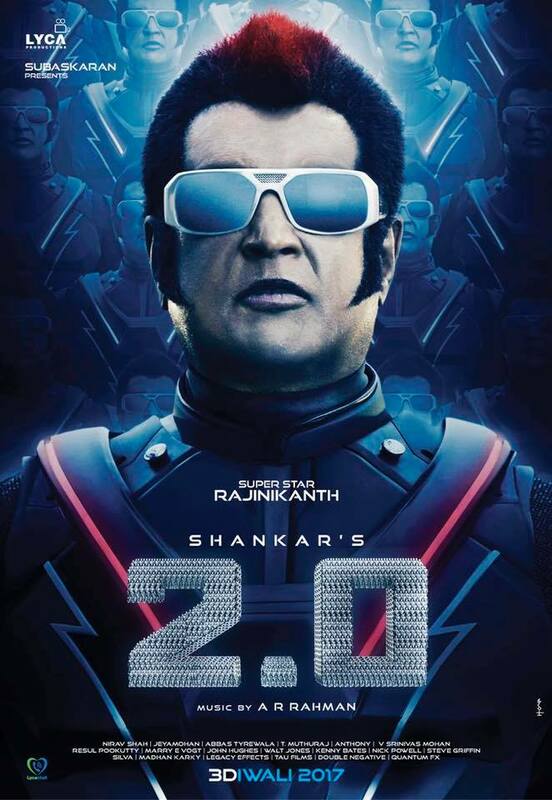 It is heard that Narendra Modi had shared his ‘Make in India’ initiative and suggested that, 2.0 can be an example of an Indian blockbuster film shot entirely in India, with Rajinikanth before he started working on this film. According to sources Rajinikanth will be essaying five roles in the movie and the antagonist of the movie, Akshay Kumar will sport in 12 roles. The film is being shot in IMAX format and will be released in the same format. Made on a budget of Rs.400 crore, the film also has Amy Jackson, Sudhanshu Pandey, Adil Hussain, playing crucial roles. Directed by Shankar the film is expected to hit theatres this Diwali. Ajnabi, Mujhse shaadi karogi tells a different story. Robot was an average affair – Shankar is loosing his touch? I rather love the Robot soundtrack! Think it’s a classic Rahman one (in the 90s Tamil sense). The latest we hear about Akshay is that he has strained himself to bring out a unique voice for the film. After the Special 26 actor dubbed his portions, it was further improved by the film’s sound engineer Resul Pookutty, which has given an amazing output and our sources say that fans will see a new Akshay in the film. Akshay will be seen in twelve different looks and his character has multiple shades. Meanwhile, an official statement regarding the final release date of ‘2 Point 0’ is expected to be out soon. Recently, there were rumors saying ‘2 Point 0’ release has been postponed due to extensive CG works. It is all about Akshay. Nothing about rajnikant so far. It seems they want to make villain centric movie and giving more importance to the villain. I think Rajni’s role is being downplayed at the moment as he any way carries lots of hype. One new poster of Rajni in a disco jacket has come. Will share it. Yes, Ramesh Bala can be trusted. This more seems to be a still from the first song. nothing about 2.0 has excited me so far – nothing….. It is somewhat like the journey from Sholay to Shaan. Bigger, more sophisticated and so on. 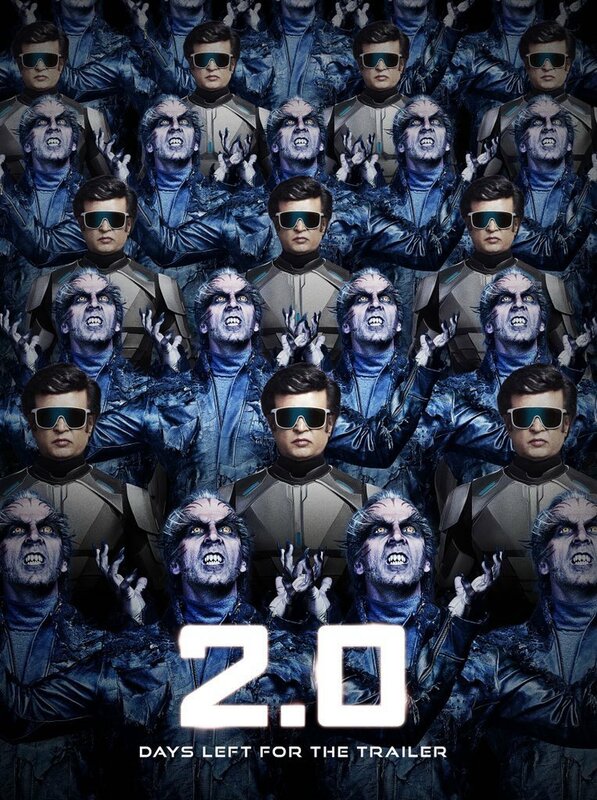 The new poster for 2.0 is so green and environment friendly. The things sticking out of the heads look like some vegetable like snakegourd or slim lauki. In Thor Ragnorak, something like iron grill is attached to the head. Akhshay’s character , depending on the overall script and presentation could either be as successful as Mogambo or could tank as Sanjay Dutt’s did in the new Agneepath . don’t think that’s remotely possible here. Hindi fans don’t quite understand the semiotics of a Rajni film. And Shankar certainly is the last person to not understand this! 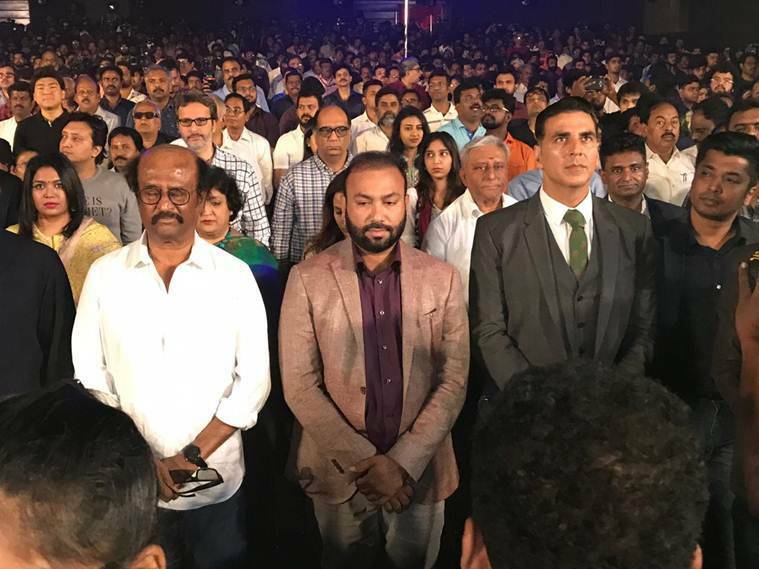 The idea that Akshay is going to overshadow Rajni here is an utter pipe-dream. Now Akshay will certainly bring in the audience in the Hindi audience and help in this sense (the first Robot was hardly Baahubali in Hindi!) but that’s as far as it goes! Even otherwise Akshay is barely recognizable here. The whole getup is so cartoonish. Its a fight between two jokers , sorry Robots …..
Agree on the cartoonish getup. reminds me of Amrish Puri in Tehlka . He should have played it like either Ajnabi one or the Nawazuddin Chracter in Kick. I quite like all these posters that shankar has released over the years. like this new poster a lot (with it’s ‘world is not enough’ echo). Yes, the tag line is cool. 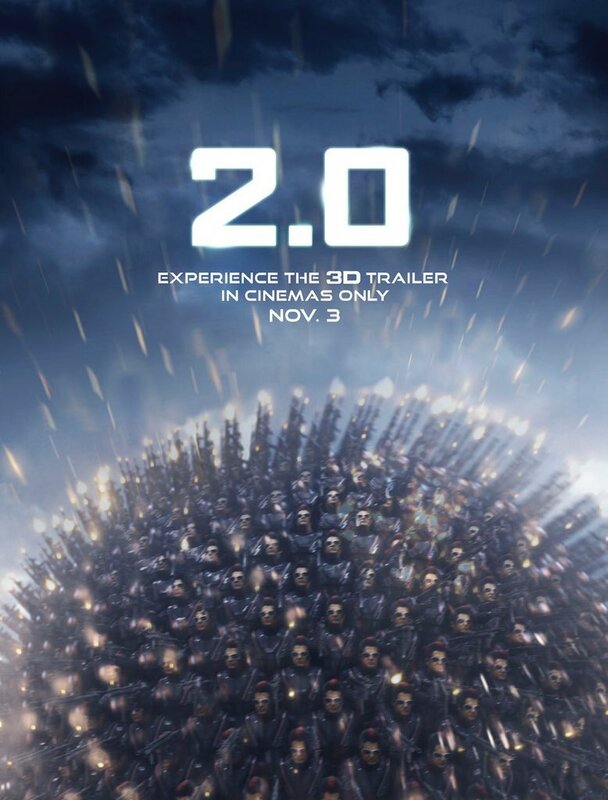 I see Rajini’s name, Shankar, Rahman on the poster…..someone seems to be missing! Only 2 songs in an entire Shankar film ??? Read that ToH has 3 songs in the film. So 2.0 trailer coming 2 weeks before ToH trailer although 2.0 will release 3 weeks after ToH. Kjo presenting hindi dubbed version of 2.0 after baahubali films. Rajni somewhat looks like Hrithik in those shades! I’ll only say that he looks more like Hrithik here than he does like Deepika Padukone. Kjo is like border control. Stopping all the important people and like a corrupt official taking the credit. credit is 2nd, 1st is H U G E mullah! he will pocket neat 50+ cr here just by putting his name and helping in distributing…. Robots + Superhero + Birds in Humans Vs Nature war – This has not been tried before even in hollywood. is it just me or there are vibes of a catastrophic mess from the posters? I loved the first film here. Not sure about this one with all the extraordinary delays and so on. Shankar comes across as a very ambitious filmmaker. His is a classic case case of biting more than one could chew. Shankar is ambitious no doubt. But he understands indian mass mentality quite well. I dont think this will be a no-show. The hindi version itself can make 100 cr or so with Akshay in it. Tamil version will anyways throw out some imaginary numbers like Roshans do. Whether overall it can recover its money – I am not sure of. But it will be in similar lines like its predecessor. Robo was entertaining in the same way many indian masala films are (but with enough of southern flavors). Angry bird! Or angry crow! There is a famous story about kakasura in our mythology. I like the posters. Whether i will buy the movie ticket or not will depend on the trailer. I liked Robot and it was entertaining. I feel this will have it as well. 75 mn dollar on VFX, its an expensive project. Akki should shut everyone down and only and only promote 2.0 till its release, this is a big budget push for him after a long long time. This isnt his tid bit toilet here and padman there kind of a movie, if it needs to mint 200 crore in North, Akki has to step on the paddle now as its his territory to get business there. 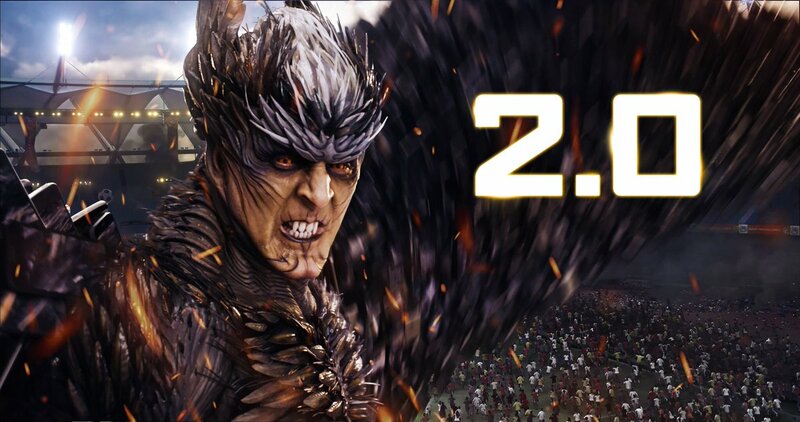 2.0: Director Shankar reveals that Akshay Kumar’s character in 2.0 has many dimensions and the audience will like it. Director Shankar is gearing up for the release of his magnum opus 2.0 starring Rajinikanth and Akshay Kumar in the lead roles. With more than Rs 500 crore as budget, the upcoming sci-fi is the costliest film ever made in India. Shankar’s desire to cast legendary Hollywood star Arnold Schwarzenegger as the main antagonist in the Rajinikanth starrer is no secret. But the ace filmmaker has now revealed that the coveted role went to another legendary actor before Akshay finally lapped it up. Shankar noted that he almost finalized the deal with Arnold. He recalled that even the Hollywood star was very keen on the project but sadly while drafting the contract, the filmmakers were not able to agree on everything. “Later I thought Kamal sir will be a great choice for the role. It was my desire to see Rajini sir and Kamal sir in the same movie. Jeyamohan (2.0 dialogue writer) and I met Kamal and discussed the role. But Kamal was more interested in doing Indian 2 and so we moved on,” the director revealed in an interview with Vikatan. Before Superstar Rajinikanth attained unparalleled stardom, he was playing second fiddle in Kamal’s films. Rajinikanth was a struggling actor and Kamal was a shining star at the time. The twin pillars of Tamil cinema have shared screen space in many movies. After 1979 film Ninaithale Inikkum, Kamal decided not to work with Rajinikanth in films, so that he could get his own solo films. 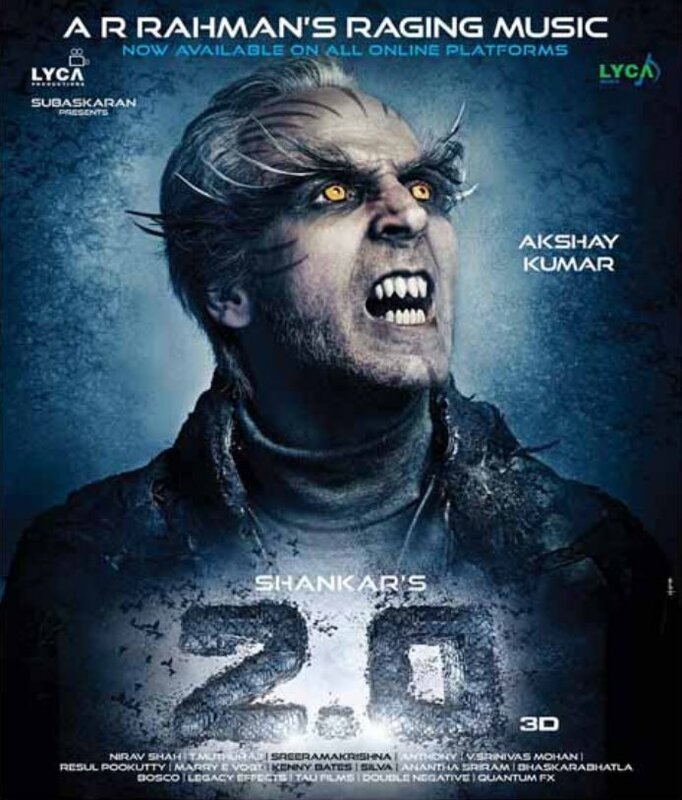 Akshay Kumar came to know about the antagonist role in 2.0 through Lyca Productions, which was interested in remaking Vijay’s Kaththi in Hindi with him in the lead. “I narrated the story to him and he was keen on playing the role. Eventually, the role was destined to go to Akshay. Or we can say, it’s for the best the role went to him,” Shankar added. While refusing to reveal the details of Akshay’s character, Shankar assured that his character has many dimensions and the audience will like it. 2.0 trailer will be launched in Chennai on November 3 at a grand event. The 3D trailer will also be simultaneously screened across the country in theaters. 2.0 is due in cinemas on November 29. Find your #2Point0RobotName using your date & month of birth. Share yours, let's have some fun! The much-awaited sequel to Robot, 2.0, starring Rajinikanth and Akshay Kumar in lead roles is set to release on November 29. The censor board reviewed the movie and has given it a U/A certificate. 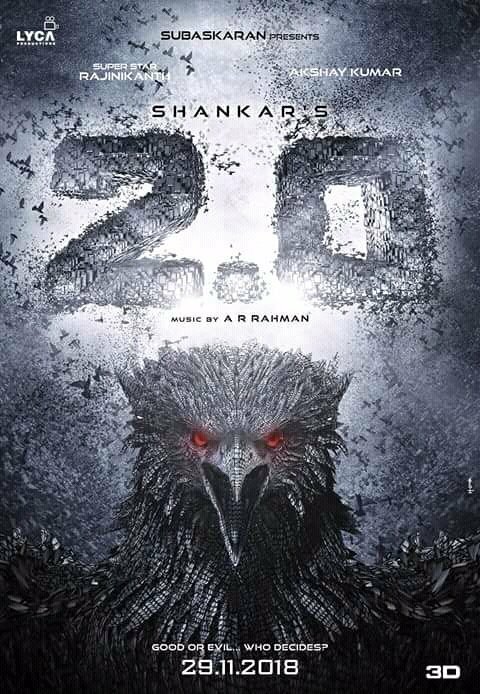 Directed by Shankar, 2.0 is being considered as India’s costliest film with a budget of more than Rs 530 crore. The movie has a run-time of 100 minutes and the trailer has already created a buzz on social media. In fact, the trailer of the film clocked more than 140 million views in just a few days of its release. 100 minute runtime??? Is that for real? That is a flop runtime, way too short. Who will pay the most expesncienticket prices ever for a movie the length of 3 Star plus serials? SRK in Zero OR Akshay in 2point0 – Who has taken more risk? Who is your choice? Q. Can Robot in Hindi be the biggest opener of Akshay Kumar? A. It would easily be his biggest opener but there will business missing down South due to regional versions showing. If this was a regular Hindi release then it had the potential to cross 30 crore nett or even higher but now it may have to settle for under 30 crore nett but it should beat the opening numbers of Gold. The trailer has a huge response in the Hindi film circuits. This looks like a big visual spectacle. I trust Shankar to get it right. The trailer was promising as well. Love that first image in this post (the one with Akshay and the spiked hair and the date)…visually arresting! I think main point which people don’t mention is that 2.0 is shot in 3D. Even hollywood is not doing it anymore except Avatar. Its not easy to do and I don’t remember the last 3D shot movie in India. It was decades back in Chota Chetan and then some small regional movie in 90’s. The quality of 3D movie is going to be mind blowing compared to 3D converted movie. So, at least for that aspect it is worth to watch on big screen. 2.0 has gained momentum , I am sensing lot of positivity around. That’s a very high prerelease number..sarkar for example was sold for.82cr in TN..and I thought that was very difficult to achieve but the movie is a hit now…2.0 is going 40 crs more than sarkar..these are very difficult numbers to achieve in TN to break even..very difficult even for a rajni movie…. Tacky, hilarious and plain ridiculous! Still do not understand why Indian film makers attempt imitating Marvel & DC & making films like Ra.1, Robot, Krrish, Drona, 2.0 etc when they can use the same budget and vision to create much more authentic content based on classical Hindustani roots like Baahubali, Padmaavat & the yesteryear classic Mughal E Azam proved. You are bang on. Indian filmmakers have not really cracked the sci-fi genre because they make inspired stuffs from hollywood. I would actually consider Baahubali a sci-fi movie rooted at indian culture. The movie had an epic battle using technologies from the nature. Science fiction is a fictional story where the characters find themselves in a setting that is just beyond the scope of what is scientifically possible. The science may be built on a minority opinion in scientific circles, but there is a clear desire to remain true to our understanding or put forth speculation for those things that are theory but not fully understood. Science Fiction stays true to the universal laws that are initially laid down and accepted. (i.e. If transportation from one location to another is possible, then the transporter cannot become a time machine without some proper scientific explanation). Another question, does a setting in the future automatically make something Sci-fi? So, to you guys, which qualifies as Sci-Fi and what does not and any thoughts. The list is random and just off the top of my head. Please add your own. (I do not believe that all of these qualify, I am just trying to get the discussion going). The Hindi version of 2.0 would lose about 20% of its audience courtesy the Tamil & Telugu version down south. In this scenario, any collection of over ₹ 150 Cr would be a great result for the film, especially considering the fact that Akshay’s upper limit in recent times has been nothing more than ₹ 130 Cr in nett terms while Rajnikanth does not really have any major box office influence outside the south of India. However, looking at the absurd and tacky visual effects of the trailer, I won’t be surprised if this falls short of even ₹ 100 Cr in the Hindi format. The Tamil format might get off to a flying start, however if the film falls flat, so would the Tamil version collections as it happened with Kabali which ultimately fell short of even ₹ 300 Cr worldwide in its lifetime run. Fan gloating has always been irrelevant to me and to the majority of the audience at large. Every film is liked or disliked based its merits or demerits and an artist gains popularity based on his or her choice of films. The reason Aamir Khan has ruled the Hindi films industry over the years is due to his choice of films on most occasions. There are only a handful of performers like Salman Khan and Rajnikanth who have blind idol worshipping fans who are willing to pay to watch them even make a phone call but on most occasions, such fans usually belong to the lowest common denominator and even their numbers are reducing with the onset of globalisation and digitisation of entertainment, as was proved by the fiasco of Race 3 and Tubelight. I’m sure had rejected films like Bodyguard and Kick released today, they’d barely have survived and perhaps might have gone the Race 3 way. In times to come, its surely gonna be content over face value and pseudo stardom for the audiences. The performance of Stree and Badhaai Ho have already set the cat among the pigeons. As long as Aamir Khan stays away from banners like Yrf and trusts his instincts to deliver content like Dangal, SS and TZP, he would surely be the next guy after Amitabh Bachchan to maintain his popularity till eternity. Agree. He needs to stop being a Firangi with his movie selections.